Intersectionality is a way of thinking about power, privilege, and oppression that takes into account a person’s combination of social identities (like gender, race, class, sexuality, ability, religion, and more) rather than considering each of them separately. For example, instead of isolating a woman’s oppression based on sexism alone, or a Black person’s oppression based on racism alone, or an LGBTQIA person’s oppression based on homophobia or transphobia alone, intersectionality looks at how those identities intersect, as in how a bisexual, Latina woman is affected by the overlapping oppressive forces of sexism, racism, and homophobia/biphobia all at once rather than separately. Intersectionality originates from the work of Black feminist scholars examining the dual forces of race and gender on the lives of Black women, and has since been used to better understand the intersections of many different identities. To put it simply, intersectionality considers the ways that multiple identities together form a person’s experiences of power, privilege, and oppression in any given situation. Thinking intersectionally would allow us, for instance, to consider how the multiple identities of a queer Muslim woman or an immigrant man with a disability work together in a person’s life. These identities and their accompanying oppressions intersect with each other simultaneously, and cannot be isolated or considered separately. In short, intersectionality helps us understand individuals’ lives with greater complexity and makes visible experiences that have been erased. Scholar Kimberlé Crenshaw created the term “intersectionality” in 1989, when she argued that we have to consider both race and gender simultaneously, not separately, to understand a Black woman’s experience of violence and oppression. Crenshaw pointed out that a Black woman may experience sexism, racism, or both; But she may also experience a particular form of racist sexism or sexist racism that’s greater than the sum of its parts—a very particular form of racism and sexism experienced by Black women, as in stereotypes about “angry” Black women or hyper-sexualized depictions of Black women’s bodies. The concept of intersectionality stretches back at least to the mid-1800s, when early Black feminists called attention to the ways their oppression was different than that of white women’s or black men’s. Since then, women of color have continued to make important criticisms of the ways that the goals of white women are prioritized within the feminist movement (known as “white feminism”), and the goals of men are prioritized within the anti-racist movement. According to an intersectional framework, anti-sexist movements should also be anti-racist, and anti-racist movements should also be anti-sexist. The importance of understanding and practicing intersectionality is crucial for highly oppressed and vulnerable populations like trans women of color. At the time of this writing, twenty–one trans women of color have already been reported murdered in the US in 2017. For a trans woman of color in particular, it isn’t just her being a person of color, being a woman, or being transgender that puts her at great risk. The combination of these many oppressive forces upon her identity directly contributes to violence she may experience. • Intersectionality is too hard and complicated for me to understand. • Okay, this one isn’t really a myth. It’s actually true—Intersectionality is complex! It asks you to listen to the perspectives of people who are oppressed in ways that you are not. It asks you to consider your own privilege and make sure you acknowledge experiences that are not your own. • However, there are ways to learn, grow, and actively practice intersectionality. The most important thing you can do to be intersectional is to be a great ally to all marginalized communities. 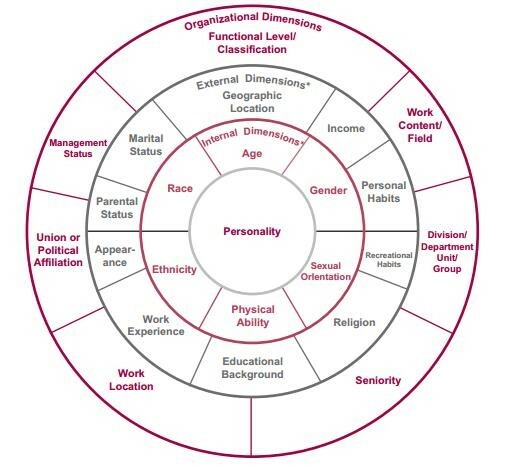 Try filling out an identity wheel and considering the ways your own identity categories intersect and create your own privileges or marginalizations. Listen to people who experience intersectional oppression, and expose yourself to people and spaces where you can learn and grow from others. • Finally, make sure you are open to being wrong. If you say something hurtful without meaning to, listen to the other person’s experience, ask yourself where that language or thought came from, and commit to doing better in the future. Intersectionality is not easy, but it is absolutely necessary if we want to live in a more just world. Check out these YouTube videos to learn more about intersectionality!